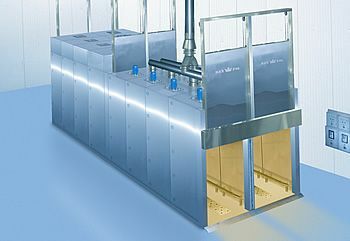 Blast cooling chambers are intended to cool the products directly after thermal processing. Process of rapid taking heat away prevents the growth of bacteria and rapid water evaporation. Thanks to that the products retain color, taste, aroma and proper moisture. saving time and in consequence shortening product production time. Blast cooling chambers are equipped with high-class microprocessor controller ensures automated regulation of parameters of cooling process. Additionally, proper air circulation in the chamber ensures uniform cooling in the whole volume of the chamber. Microprocessor controller in the blast cooling chamber allows for saving the cooling process parameters and the process data saving precisely meats HACCP standards.